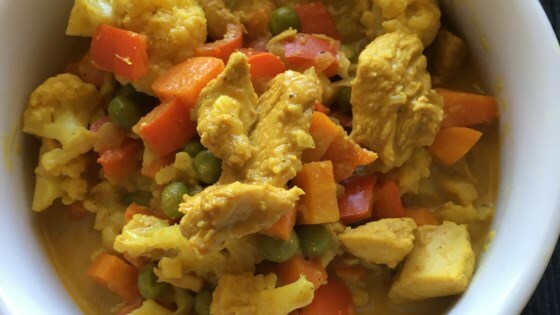 "This is a mild creamy curry with loads of flavour. Perfect as a low-carb meal on its own, or serve it over a bed of rice." Heat ghee in a large pot over medium heat; cook and stir onion until tender, about 5 minutes. Stir garlic, curry powder, cumin, ginger, salt, turmeric, cardamom, cinnamon, cayenne pepper, and nutmeg into onion; cook and stir until fragrant, about 1 minute. Stir chicken into onion mixture; cook for 2 minutes. Stir carrots, coconut milk, cashews, and tomato paste into chicken mixture; simmer for 5 minutes. Stir cauliflower into chicken mixture; simmer, covered, until vegetables are tender and chicken is cooked through, about 5 minutes. Stir peas, red bell pepper, and cream into chicken mixture; reduce heat to low, cover, and simmer until heated through, about 10 minutes. Increase the heat by adding additional cayenne pepper. Halved this recipe as there only two of us and it still made a lot. The recipe is delicious and perfectly spiced. Family loved it, will go on the do again list. This was delicious! My husband travels to India frequently. He said this was good, even better than what he’s had there. It’s a keeper. This was good. I would make it again, using more chicken, no peas, and would serve on rice. Needs a little more salt.